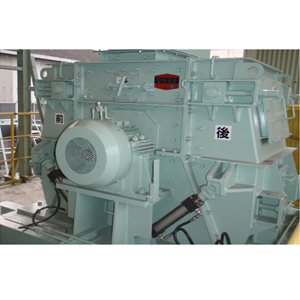 Hammer Crusher for Coal | Product Information | KURIMOTO, LTD. Demonstrates good performance in crushing coal! The Hammer Crusher is an impact crusher designed to repeatedly crush raw material between a beater head rotating at high speeds and breaker plates. A number of hammers deliver an outstanding crushing effect. The consumable parts are made of high chromium cast iron from Kurimoto, a manufacturer of wear-resistant special steel, to extend their service life. This system doubles the continuous operation time of consumable parts compared to conventional systems. The unique structure enables crushing of raw materials of comparatively high moisture content. Suitable to crush coal, limestone, quicklime, plaster boards, bricks, tile materials, etc.